We’re (almost) one month into 2018 – can you believe it?! It seems to be flying by! The new year is usually looked at as a time of new beginnings, fresh starts, and big changes, but this year I’m noticing a shift in this narrative, and it’s totally changing my perspective on things! In the past, I’ve spent weeks leading up to January 1st making lists of all of the things that I need to change about my body, my lifestyle, my habits, etc., putting them into a note in my phone or writing them in my journal, and then promptly forgetting about them until January 1st comes around the next year. I’ve created big “goals” for myself of the things that I wanted to accomplish, most of which were far-fetched ideas based around the things that it seemed like I was supposed to be doing, and never checked even one off of my list. It was a waste of my time, and ultimately, made me feel guilty and defeated when I didn’t achieve these totally unrealistic goals! Why I was stuck in this pattern for so very long I’m not sure, but what I do know is that I’m slowly learning that I don’t have to be any longer! 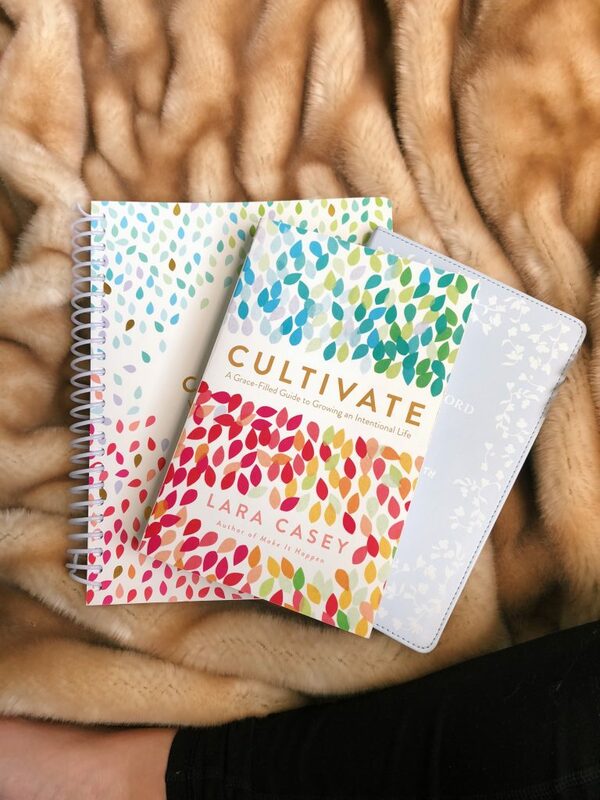 One of the most impactful things that I’ve done for myself in 2018 is purchased my own set of Power Sheets from Cultivate What Matters, and they have helped me change my perspective on how to set goals, where my goals come from, and how to stick to them intentionally. 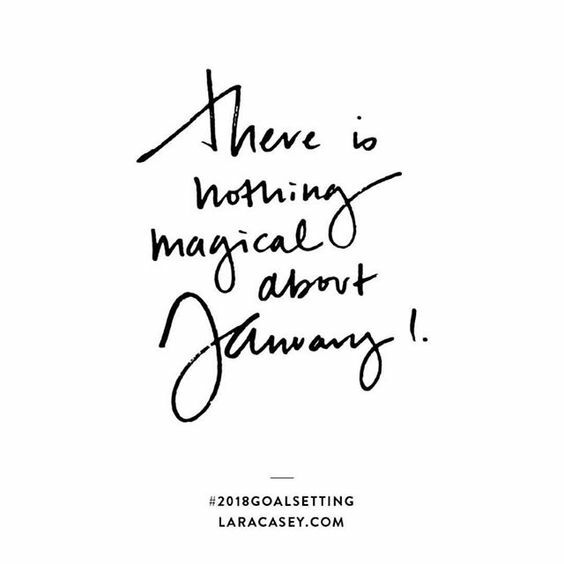 But more than that, Lara Casey, the founder of Cultivate, has taught me that January 1st is not the magical date when all things reset and all new goals are decided on. But you can start your goals on January 2nd, 3rd, next Wednesday or December 31st – it doesn’t matter! In the past I’ve been the queen of “the diet starts on Monday” talk, and I’m trying to no longer use excuses like that. Now I have a confession… I have always thought picking a word for your year was a very “woo-woo” type activity and kind of silly. Because of my “create and forget” mentality that went along with planning my resolutions, I didn’t see the point to choosing a word, as well. But I’m taking it all back because I’ve chosen a word that I’m carrying with me throughout the year, and it’s been truly eye-opening. 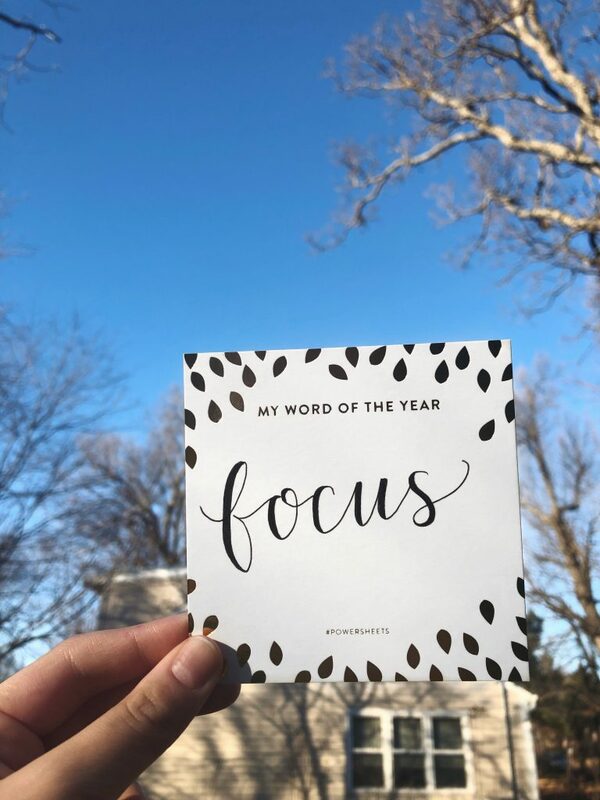 My word for 2018 is FOCUS, and I’ll tell you why. Going through my Power Sheets prep work I did a lot of brainstorming and answering some tough questions. And one of the things that I realized about myself is that I want to do everything all at once with no breaks or rest or grace for myself. I want to read 52 books and spend time with friends and family every day of the week and run a race and learn a new language and teach myself a new skill and the list goes on and on. I want to do all the things, and I want to be excellent in every single one – I know it sounds crazy. I just have a hard time sitting still – even if I’ve had a full week of time well spent, if I were to sit on the couch on a Friday night binge-watching my favorite show, I’m going to be disappointed with myself at the end of the night because I didn’t get anything productive done. I know it sounds crazy, but I have a hard time being still. So 2018 is a new space for me to practice focus on the things that truly matter to me and saying no to all the rest. In 2018 I will focus on reading books that give me real joy, rather than books I just think I want to read because everyone else is reading them. In 2018 I will focus on resting when it’s time to rest and giving myself grace to do so, even when it seems like there’s a million other things I should be doing at the time. In 2018 I will focus on building intentional friendships with people that pour into me and build me up. So I definitely don’t have it all together, but this is what is working for me this year, so I’m running with it! Do you pick a word for the year that you carry with you? Let me know what yours is and how you choose it! If you haven’t set any goals for 2018 or chosen a word of the year, then I encourage you to start thinking about what that might look like implemented into your life. It may take some time to get it started, but it seems to me that January 25th is the perfect day to do it! « National Handwriting Day + Free Printable!